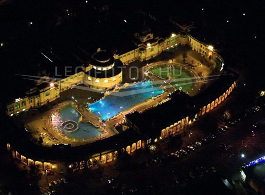 Enjoy an incredible pre New Year’s Eve pool party in the warm thermal baths in Szechenyi Baths on December 30, 2019 to welcome 2020 ( date not confirmed yet!). Tickets will be later on sale, please bear with us! We usually sell the party tickets out like hot cakes, so don’t hesitate to make a dive. 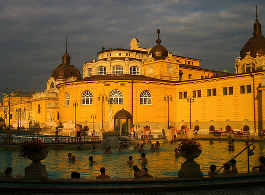 And YES, the party will be in Szechenyi Baths. More about New Year Club in Budapest, clubbing, things to do, parties, events on and around Dec 31. 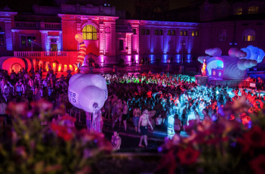 The party organizers reserve the right to make changes in the sparty program. 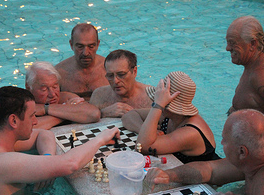 is there a way to keep some belongings with you/near you while in the pool? Phones, cigarettes etc.. ? we recommend you keep your belongings/ valuables in the cabins or lockers. Of course, you can leave them with your towels by the pools, but they can get wet and you might not see them all the time. Hi this is Shawly from Dubai, Can I buy a tickets for new year Party ? Hurry up, only a couple of ticket types are available, and they are selling out fast. Is there something like a 5-person group ticket ? I am afraid, the group discounts are starting for groups at least 10 guests. Hello. I just bought 3 single tickets for myself and two of my friends for the New Years party. However they only asked for one name so I only put in mine. The three tickets on my email all said guest:my name. Will this be a problem when we try to enter, I don’t need all three tickets for myself. no, it won’t be a problem as long as you arrive together. Hello, please inform if it is organised also new year party on 31. December? 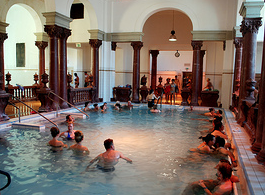 the pre_NYE Spa Party will be on 30 December. Hi. Will there be space heaters at the party? I’m trying to figure out how cold it will be when not in the water. :) Is there any plan to heat the surrounding areas?